Dmitry Vedenyapin was born in 1959 in Moscow. He graduated from Moscow State Pedagogical Institute of Foreign Languages (1995). His works were published only outside the USSR during the Soviet era, but since 1987 his poetry has been published in numerous magazines including “Oktyab,” “Novy mir,” “Znamya,” “Novaya Yunost,” “Postscriptum”, and many others. Vedenyapin is the author of six poetry collections. 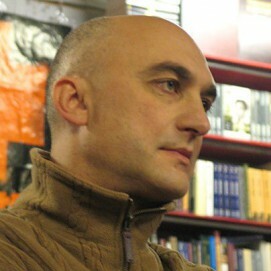 He won the Big Moscow Score Poetry Prize in 2010 for the book Mezhdu shkafom I nebom (Between the wardrobe and the sky). His poems have been translated into English. Vedenyapin is widely recognized as a translator of both poetry and fiction from English (Michael Cunningham, Bruce Chatwin, Arthur Miller, etc. ), French and German.